LAPD Reserve Officers have been in the news a lot lately. Last year, the press profiled the Corps as Reserve Crime Suppression task forces were launched in Hollywood and Pacific, during deployment on Halloween, and KNBC-TV recently ran a feature on Reserve Motors. Each story “discovers” that the City of Los Angeles has reserve police officers, and that they are held to the same standards and responsibilities as full-time officers. It was in 1947 that the official Police Reserve Corps was established, as per a Los Angeles City Council ordinance. The Corps has evolved over the years, and the standards for Reserve Police Officer of the Los Angeles Police Department have been progressively upgraded to match that of regular, full-time officers. Several families have had a couple of generations in the Corps. Paul V. Martinez joined the Corps in 1951. His son, Reserve Officer Paul M. Martinez, remembers his father going downtown to sign up for shifts. In those days, reserves worked primarily special events and details. One time, Officer Martinez recalls, his dad was assigned to work an event at the Greek Theater — and it turned out he was the only officer assigned to work that event. “He had taken me with him,” Officer Martinez recalls. “He conducted traffic control and put me to work because it was a two-man operation back then. He taught me how to manually operate the traffic signal.” The uniform for reserve officers was different then. There was the diamond-shaped “reserve officer” badge, and officers wore white caps and white shoulder patches. 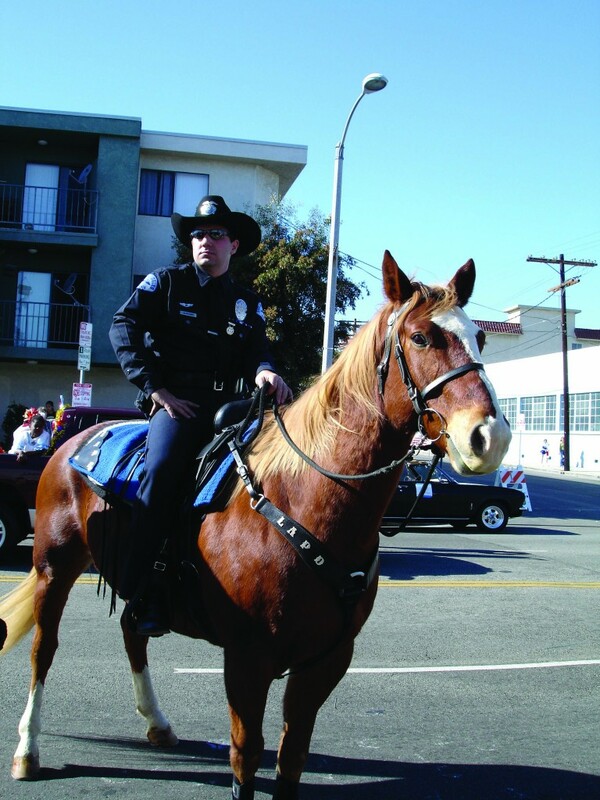 The modern Reserve Corps developed in the 1960s: A mounted unit was established at Van Nuys, which was subsequently transferred to Foothill. As Reserve Officer Dan Henderson describes, “The unit consisted of five regulars and two reserves, Neil Stringer and Dudley Winstead. Soon the Foothill Reserve Unit had a total of 12 officers, and it had its own oral/review board. By then, a couple of officers were working black and whites.” Neil Stringer, a general contractor, would later lead the Foothill Reserves in the building of the Chapel, above the rock garden at the LAPD Academy. In 1968, the LAPD began a line reserve class. It was the year Adam 12 debuted. Chief William H. Parker had died two years before. Jack Webb was producing the second version of the Dragnet television series, playing Sergeant Joe Friday, this time in living color. Gary Hazel entered this new Academy. Line Reserves were to be trained as regular field officers, and assigned patrol duties when they graduated. “We started the class at Parker Center and then moved to the Academy. We didn’t take our physicals until about a third of the way through the training because the funding wasn’t fully in place yet. We wore civilian clothes and didn’t receive our equipment until shortly before graduating.” This new line reserve class was six months long (two weeknights and every other weekend). It started with about 80–90 recruits and graduated about 35 officers. After he graduated, Hazel was assigned to 77th Division. On his first day, he reported to the watch commander as a new reserve police officer. The W/C looked up and said, “What the hell is a reserve officer?” Reserve Officer Hazel found himself working the desk the first day; later, he was assigned to a report-writing unit; as a third officer in a patrol unit; and finally he was working a regular two-officer “Adam-unit” patrol car. Officer Hazel continued patrol — at 77th, Hollywood, and Hollenbeck — for over 35 years until he retired in 2002. Reserve Officer Henry Baez recalls that in the mid-1980s, a pilot program at Newton was rolled out, whereby two line reserve officers would work together, first as Z-units, chase units, and shortly thereafter, A-units. Another accomplishment during this period was the promotion of qualified reserve officers to a Certified Designated Level-1 (CDL-I) status, providing expanded opportunities to work specialized details (i.e, CRASH/SPU, COBRA, Detectives, Metro, Air Support, Narcotics, Vice, Anti-Terrorism, IA) and as reserve T/Os. The LAPD also implemented a Technical Reserve program. “Technical Reserve Officers …” the recruitment brochure at the time said, “provide support services to field personnel such as desk, community relations, detective follow-up, and related assignments.” The value of the Corps was also increased by the addition of “Specialist” Officer, a position for community members who possessed special skills and were called to duty on an as-needed basis. There have been two LAPD Reserve Police Officers killed in the line of duty: Stuart Taira, Air Support Division, died in a helicopter accident on March 1, 1983, and — in a story that has been nearly lost — G.B. Mogle, from 77th Division, shot by a prowler suspect on July 31, 1946. Reserve Officer Mogle succumbed to his wounds a week later on August 7, 1946. The suspect was captured five days later. 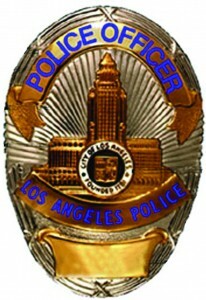 The badge has evolved over the years, from a diamond-shaped “Reserve” badge, to the famous oval LAPD badge (which the Department had originally adopted back in 1940), that read “Reserve Policeman” or “Reserve Policewoman,” until finally the badge just read “Police Officer.” In 2007, the R on the badge number was removed. The Reserve Corps was eventually modified to conform to the state standards we have today, as per the California Commission on Peace Officer Standards and Training (POST). The designations of sworn line and technical officers evolved into the Levels 1, 2, and 3. Reserve Officer Jim Lombardi spent a lot of time in Sacramento working on this legislation. There are currently over 700 active LAPD reserve officers today. They work a variety of assignments – from Patrol to specialized details (Detectives, Vice, Air Support, Motors, and Mounted units.). The hours and duties worked by these 700 officers are equivalent to a force of 100 full-time peace officers. Old-style reserve badges. Today, LAPD’s Reserve Police Officers wear the familiar badge and uniform of the Los Angeles Police Department. 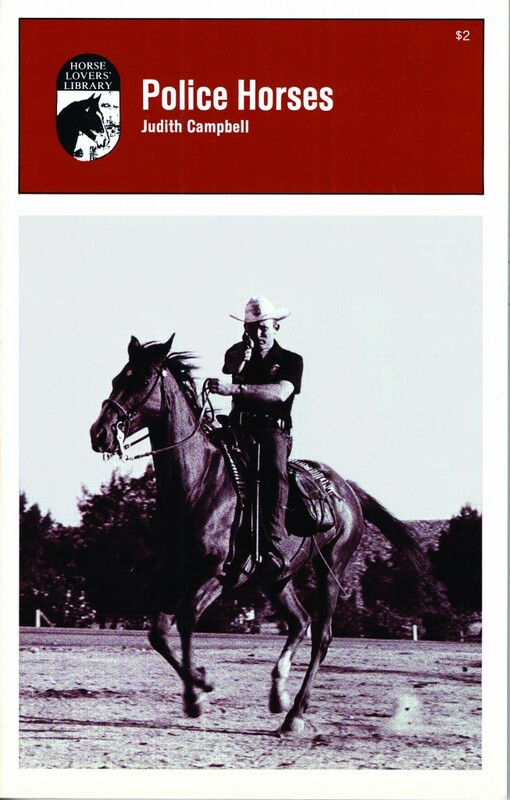 Left, Reserve Officer Dudley Winstead on the cover of the book, “Police Horses” by Judith Campbell, originally published in 1967. Right, Reserve Officer J.T. Alpaugh, currently assigned to Metro’s E-Platoon/Mounted Unit.